April was as usual our Annual General Meeting followed by a talk with the outgoing WPCS Young Ambassador. Mr Gareth Watkins gave us an encounter of his time in the role and a little about his life history. During April we also held an educational Seminar for both In-hand and Ridden at Cel Aeron Riding School, numbers were rather low on the evening, but those present benefitted in an educational and interesting talk with Geraint Thomas and David Jones of the Telynau Stud. There was a nice selection forward of examples of the five sections and the committee is grateful to all those who provided ponies and cobs on the evening. A lovely evening was had on the 1st of March at the Rugby Club in Lampeter with our members. Thank you for the Rugby Club for providing us with lovely food once again this year and for Dyfan Ellis Jones from Llangwyryfon YFC for entertaining us with his power point when he visited America on an exchange with the YFC. Due to unforeseen circumstances our guest speaker Mr Swistun could not attend this evening, however we were very grateful to one of our committee members who stood in at short notice. An inter-association quiz night, with Daniel Morgan of the Parc Stud as Quiz master. Carmarthenshire Association proved to have the most brains on the evening, and won the prize of £20 but very kindly gave it back to our association. It was lovely to see so many at the annual Christmas dinner and points presentation at the Rugby Club, taking supreme champion was the Davies family of Henfynyw Stud with reserve going to Mr Arnold c/o Corscaron Stud. 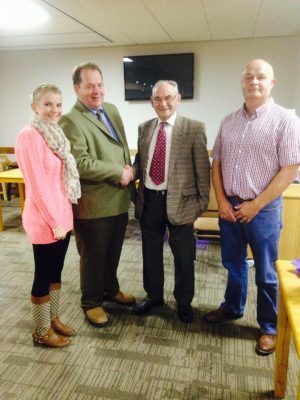 The Annual Concert was also held in November at the theatre in Felinfach, in the company of the well known artists John & Alun and Dyffryn Cothi YFC. Mr & Mrs Dafydd Morris, Neuadd Parc were the president’s for the evening, we thank them both for their generous donation and to everybody who supported the evening. £1000 was donated to the Chemotherapy units at Bronglais and Glangwili Hospitals. 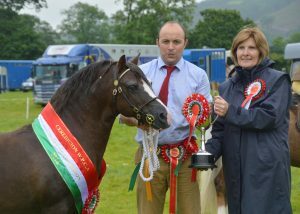 Welsh Pony and Cob Society open Forum hosted by the Ceredigion WPCA. 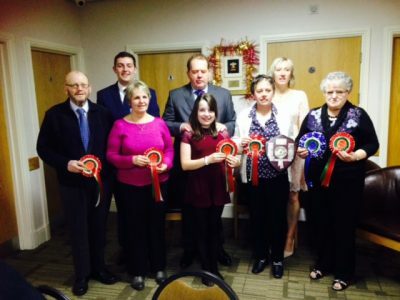 The evening was open to all members of the Welsh Pony and Cob Society, Ceredigion WPCA welcomed all members from the surrounding area however near or far. Trustees Mr Geraint Hughes (WPCS Chairman), John Kirk, David Roberts and Stewart Franklin were present and were more than happy to answer within their remit any questions or concerns that you we had within our Society, which led to a lively and enjoyable discussion. The association would like to thank them for their presence. The Annual Concert was also held in November at the theatre in Felinfach, in the company of the well known artists John & Alun. Mr & Mrs Dafydd Morris, Neuadd Parc were the president for the evening, we thank them both for their generous donation and to everybody who supported the evening, the proceeds went to both the Chemotherapy units at Bronglais and Glangwili Hospitals. An entertaining evening was had at the Lampeter Rugby Club in the presence of WPCS President Mr David Rowland Harris of the Pennal Stud. It was lovely to see so many members old and new enjoying the talk about the history of the Pennal Stud and Dai’s Family tree! On conclusion of the evening officials of the association presented Dai with a cheque of £500 towards the Presidents fund at the AGM.